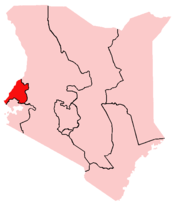 Location of Western Province in Kenya. The four traditional districts of Western Province, Kenya. 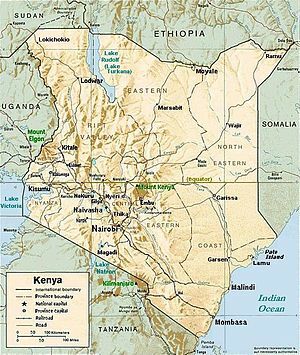 The Western Province of Kenya , bordering Uganda, is one of Kenya's seven administrative provinces outside Nairobi . It is west of the Eastern Rift Valley and is inhabited mainly by the Luhya people. Quakerism is widely practised here. Kenya's second highest mountain, Mount Elgon is located in Bungoma District . The Kakamega Forest rainforest is part of the area. The province capital is the town of Kakamega . In 1999 the total population was of 3,358,776 inhabitants within an area of 8,361 km². Western Province has diverse physical features, from the hills of northern Bungoma district to the plains bordering Lake Victoria in Busia District . The highest point in Western Province is the peak of Mount Elgon , while the lowest point is the town of Busia on the water at Lake Victoria . The climate is mainly tropical, with variations due to altitude. Kakamega district is mainly hot and wet most of the year, while Bungoma district is colder but just as wet. Busia district is the warmest, while the hilly Vihiga District is the coldest. The entire province experiences very heavy rainfall all year round, with the long rains in the earlier months of the year. Farming is the main economic activity in the province. Bungoma district is sugar country, with one of the country's largest sugar factories, as well as numerous small-holder sugar mills. Maize is also grown for subsistence, alongside pearl millet and sorghum. Dairy farming is widely practised, as well as the raising of poultry. There is a small but important tourist circuit, centering on the biennial circumcision ceremonies. Kakamega district has a mixture of both subsistence and cash crop farming, with sugar cane being the preferred medium to large scale crop. The district has two sugar factories. There is also a significant tourism industry centering on Kakamega Forest. Busia district experiences perennial floods from the Nzoia River, and the dominant economic activity is fishing on Lake Victoria. Limited commercial farming is also practiced, mainly of sugar cane. Subsistence farming of cassava is widely practiced. Vihiga district has large tea plantations, and is the most densely populated rural area in Kenya. Quarrying for construction materials is a significant activity in the hilly district. Dairy farming is also widely practiced in Vihiga. Western Kenya has many large factories, including sugar processing plants (4 factories). The largest of these is Mumias Sugar, based at Mumias , to the west of Kakamega. This factory produces the dominant sugar brand in Kenya and is an economic success story. Also in Western Kenya is the largest paper factory in Africa (Pan Paper Mills in Webuye ) and chemical processors. Despite this, living standards are generally low and social amenities like running water and electricity are not available to the majority of the province's residents.